I really like this. 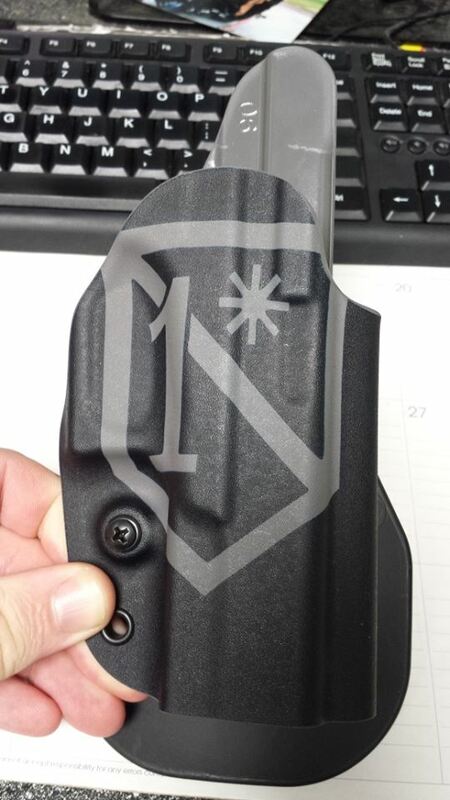 This is a G-Code OSH holster, which is enough right there to be like “I’m down with that.” But what makes this one interesting is that it’s Gray Kydex that’s been stained/dyed black on the surface to leave a Pattern. Pretty much any logo or design you want within 1 color limits. The stain is soaked into the kydex so it’s very tough any only deep scratches will dig down to the gray substrate. Which means you can rock this rig for years and that design will still be there. We are looking at how possible it would be do offer this as a production option, with the logistics and costs. I think this is cool as hell, but logistically a nightmare to set up. There are also technical issues to overcome within the web store for allowing a limited number of any one item to be sold. I’ve got it all figured out, but need to come up with a way to test it to make sure it works right without screwing everything up. I’d take a few ( for the 92FS, & S&W L-frame, P01, BHP etc..) if they had an Eagle, Globe and Anchor on them! That’s a good idea! With everybody from Springfield and S&W to FN USA offering “range kits” and “self-defense” packages that offer 3 mags, holsters and mag pouches, these holsters (especially the paddle version) and associated mag pouches would probably be very desirable to the firearms manufacturers mentioned above. That would be an excellent coup for G-Code. Wouldn’t the Lionheart logo look spiffy on the holster?? Come on..do it, you know you want to….